Why Does Oil Hover Around $50 Dollars? When it comes to the price levels for most of the financial markets, the round numbers play an important role, both from a technical analysis perspective and from a psychological level as well. A round number in the financial markets is defined as price levels that are ending in zero. These round numbers gain significance depending on where they occur and can change from one asset to another. In gold futures for example, the price levels of $1150, $1100, $1200, $1250 are important levels. Among these levels, the round numbers of $1100 and $1200 take higher precedence. When it comes to currency futures for example, price levels ending in zero, such as $1.1100, $1.1000 and so on in euro fx futures are of significance. In the currency markets, where round number levels are easy to come across, key price points such as parity and levels such as 1.20, 1.25 or 1.50 play an important role. The oil futures markets are also no different and round numbers play an important role. Broadly speaking the oil futures have some strong round number levels. $100 and $50 levels are viewed as strong psychological round number levels for the oil markets. Although, other levels such as $30, $40, $60 are also important, the $100 and $50 levels take higher precedence. Ever since oil prices fell off the cliff from above $100, the $50 level has gained importance. There are a number of reasons why the $50 price level in oil is widely talked about. One of the simplest explanations is that the $50 level in oil indicates a 50% drop in oil prices since the $100 a barrel level. Secondly, depending on where prices are trading (above or below the $50 handle) the round number level can act as a support or resistance level (supply or demand) in technical terms. For crude oil, the $50 handle has become the new norm, especially after the decline from $100. Only a few months ago, when crude oil was trading near historic lows, $30 was the much talked about level. Thus, round numbers have played an important role for the markets and continue to play a role when it comes to technical trading levels. What is the psychology behind round numbers in trading? Will there be more upside in oil? 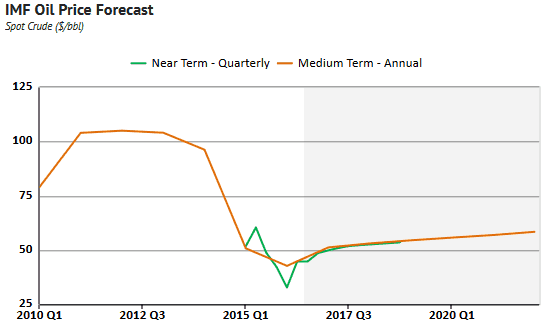 What does the future hold for oil prices? The round numbers or whole numbers in trading take a special place among traders. Many view these levels where prices can find support or hit resistance. The round numbers and the psychology has been so important that it has also led to many academic studies as well as many trading strategies. The reason why whole numbers or round numbers are so important is the fact that they are simple and easy to distinguish. It is also simpler especially with automated trading systems and even with manual trading systems. For example, setting a trade entry or exit or a take profit level at $20, $30 and $50 respectively is a lot easier than compared to using levels such as $20.63, or other price levels with decimals. For the markets in question the round numbers also give an idea of whether the prices are rising or falling. When Crude oil prices hit $30 around early January – February last year, the number indicated that crude oil prices were trading near new 52-week lows. In this context, the reference to $50 was more so as a level of resistance, meaning that the round number would act as a ceiling for prices. On the other hand, during the early days of the Crude oil price decline the $50 price level acted as support as seen in the chart below. Similarly you can see how the $30 level acted as a support level briefly before prices rallied. In the current market context, the $50 level in Crude oil is seen as a major milestone, especially after oil futures fell below $30 a barrel in January – February last year. The rally in oil markets came about after the OPEC nations finally managed to get together to agree for curbing oil production in November last year. The rally from the $30 handle in crude oil since last year came on multiple attempts made by the OPEC member nations. Oil traders were hopeful since January/February 2016 that the OPEC nations would come to a consensus to limit the markets which have been oversupplied by oil. The first meeting which was held in Doha around mid-2016 fell apart as some of the OPEC member nations failed to see eye to eye. The OPEC nations have always been known for their mistrust and more importantly the geo-politics that played a major role. The Doha oil meeting fell apart after Iran and Saudi Arabia failed to come to terms on the oil production cuts. Still, members remained hopeful of a deal which saw oil prices support above the $30 handle. For oil traders, the round number $50 was clearly a strong resistance level of a price ceiling. This was viewed as a level that oil prices could hit on a potential deal to cut supply. Eventually, when OPEC leaders and non-OPEC producers agreed to limit oil production in November 2016, Oil prices rallied strongly to the $50 handle. Since November 201, oil prices have been hovering around this level ever since. For the first half of 2017, some of the leading international agencies have predicted that oil prices could remain flat near the $50 handle. The World Bank's commodity forecast report expects oil prices to rise to $60 by end of 2018 and projects an $80 price in oil by 2030. The International Monetary Fund (IMF) also has a similar projection as the agency forecasts oil prices at $50 until end of 2017 and rising to $60 a barrel by the second quarter of 2020. Many other agencies, including the OECD have similar views suggesting that the days of $100 for oil are history. Although the OPEC and non-OPEC leaders struck a deal in Vienna in November 2016, traders remain doubtful on how long the oil cartel will be able to keep supply in check. The OPEC nations are notorious for giving false data including production levels, which has been a major cause for concern. Despite the rally that followed after the November OPEC deal, oil traders have remained doubtful on a number of other factors and the technicalities of the production cut deal itself. For example, the deal in November happened due to the fact that OPEC had to give some concessions to countries such as Libya and Iran. This has put more pressure from nations like Russia and Saudi Arabia to curb production levels in order to make any difference. No matter how one looks at the crude oil market it is clear that the Saudi Arabia led strategy of opening the supply gates to flush out the expensive U.S. shale oil producers has backfired. While shale oil producers require higher oil prices for their profit margins, the supply glut sent the industry into a consolidation as the industry scaled back on supply as well and lowered the investments in oil drilling and exploration. The price of lowering oil prices came at a heavy cost for Saudi Arabia as it had to re-adjust its budget and even cutting down on oil subsidies that the nation enjoyed. The budget deficit as a result of lower crude oil prices started to have a significant impact on Saudi Arabia’s economy. Having weathered the worst, the OPEC led production cuts has led to higher oil prices, which has seen the return of the U.S. shale oil producers. The increased production from the shale oil producers has meant that any attempts to limit oil supply to prop up demand is unlikely to have much long term effects. The U.S. crude oil inventories as reported by the U.S. Energy Information Administration (EIA) shows that U.S. commercial crude oil stockpiles remain near historical highs. More recently, some OPEC officials have suggested extending the production cuts further beyond the initial six-months as initially noted. While OPEC is said to have complied with its oil production cuts which is nearing 100% now, the relative non-OPEC production cut compliance has also steadily increased. 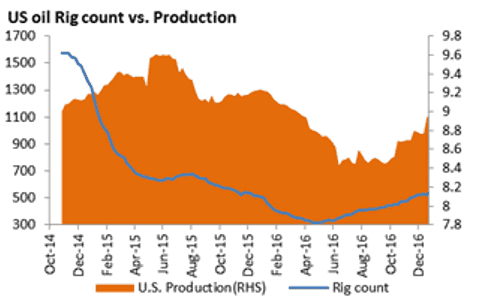 This is evidenced by the fact that the U.S. oil rig count has started to increase for eight consecutive weeks. Latest forecasts estimate that U.S. shale oil output will continue to rise into April. Crude oil prices fell below the $50 handle as the optimism that the OPEC and non-OPEC led production cuts will lead to high oil prices is starting to fade. Data shows that supply from a majority of OPEC members with production targets according to the November production deal fell to 29.88 million barrels per day in February 2017 while production by all other OPEC nations including Libya and Nigeria fell to 32.14 million barrels per day. Oil prices have remained a guessing game for the most part and even in the initial days of the supply glut, no one expected oil prices could crash below $30 a barrel. Be that as it may, the rising trend of the electric cars is something that has led many oil traders to wonder how crude oil prices will change as electric cars become more main stream. According to some estimates, the declining price of electric vehicles or EV's could coincide with the peak in oil demand by 2020. While the reports were dismissed, as oil companies came out with their own estimates, the fact remains that the world’s crude oil supply is likely to see demand over the next half a century or so. Saudi Arabia has so far made claims that it has enough oil to last for another 70 years, while oil majors such as Exxon and Shell have given around 15 - 20 years. 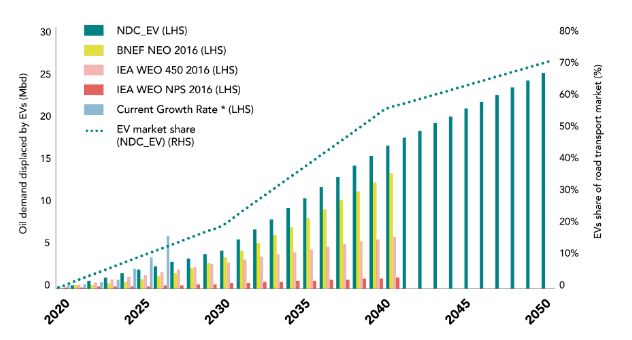 The above chart shows the levels of oil demand that will be replaced by electric vehicles with the data indicating that EV’s could start taking away the market share from crude oil by 2040, accounting for close to 40% - 50%. While in the longer run it is quite clear that the focus is shifting to clean energy as a viable source of fuel to meet the energy demand, oil prices are unlikely to go away any time soon. However, the high oil prices of $100 a barrel is also slowly becoming history as oil drilling that is primarily confined to the Middle-East will have to start competing with shale oil. For investors, considering stocks such as Tesla and other automotive companies such as GM are alternative options as the electric vehicle sectors start to pick up steadily. Tesla is likely to be of particular interest to investors as Elon Musk is seen to ultimately tie together the solar panels business alongside Tesla motors. Other automotive companies have also forayed into launching their own versions of electric vehicles. Companies such as Volkswagen and Nissan along with high end maker such as BMW coming out with their flagship EV's gives enough reason for investors to start taking notice of the rise of cleaner energy companies. While oil prices have so far managed to dominate the energy sector, it is unlike that the commodity, often dubbed the black gold will be able to maintain its top spot. Oil companies have already diversified their businesses into other forms of energy such as natural gas and other bio fuels. All of this combined is likely to be a threat to oil prices 15 – 20 years down the line. However, in the very short term, crude oil prices still dominate the day to day headlines.